Mac OS X 10.4 (Tiger) comes with a new version of Apple’s Mail client, and it’s a mixed bag. The new Smart Mailboxes feature is not quite mature, and the Find feature has gone from bad to worse. But smart mailboxes are a noteworthy and promising innovation, and Mail 2.0 (or 2.0.1 with the OS X 10.4.1 update) is a beautiful program that works really well with other Apple programs. The most exciting new feature in Mail 2 is the Smart Mailboxes feature. A smart mailbox doesn’t actually store anything. It’s simply a saved search that updates automatically to show you the latest results every time you click on it. In addition to doing the filing for you, smart mailboxes are much more flexible than ordinary mailboxes. They can show messages stored in several different places, and the same message can be found in more than one smart mailbox. 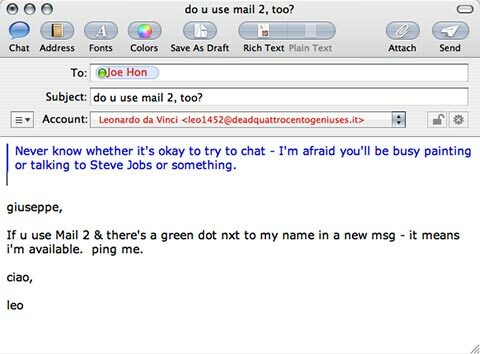 Mail 2 looks beautiful and works hand-in-glove with Apple‘s other apps. The little green dot next to the recipient’s name shows you that he’s online right now and available to chat. In the future, perhaps, smart mailboxes will eliminate the need for actual mailboxes and filing rules. Unfortunately, Mail 2’s smart mailboxes aren’t smart enough to be really useful yet. Because Mail doesn’t have labels or keywords, there is no way to mark exceptions. There is a clever plug-in for Mail 2 called Mail Act-On from Indev that, among other things, lets you edit Spotlight comments for individual messages right in Mail; you can then define a smart mailbox that finds these comments. But this capability needs to be built into Mail. Mail 2’s Find feature now uses Spotlight, but Mail itself doesn’t give you access to much of Spotlight’s amazing power. For example, you can’t simply search for messages by date, or by multiple search terms. And now the Find feature is awkward to use. As soon as you type a few letters in the Find field, Mail starts listing messages without waiting to learn where you want it to look. You used to be able to tell Mail where to look before it started looking, but now you have to let it start first, and then stop it and correct things. Dumb. Mail 2 is beautifully integrated with Tiger. I just gave my ten-year-old daughter an e-mail account and, with the new parental control features in Tiger and Mail 2, messages that come from addresses not in her approved list come to me first for review. Mail plays nicely with other Apple programs, too. For example, it tells you which of your iChat buddies are online at the moment. Photos received can be saved to iPhoto with a mouse click. Some iPhoto-like features have been moved right into Mail. When an incoming message contains a number of pictures, I can view them as a slideshow without leaving Mail. And I can resize an outgoing image file right in Mail’s message composition window. The last thing I’ll note here is the first thing you’ll notice for yourself: Mail has had a makeover. It used to be pretty. Now it’s drop-dead gorgeous. Mail 2 is free. If you have Tiger, you’ve already got it and I recommend you give it a try. If you’re using one of Mail’s commercial competitors like Qualcomm’s Eudora, Microsoft’s Entourage, Bare Bones Software’s Mailsmith, CTM Development’s PowerMail, or GyazSquare’s Gyaz Mail, you may not be persuaded to switch. But I bet you will at least be tempted.